I am excellent at locating Hybrids and Sand Bass on guided Lake Lewisville fishing trips year round. 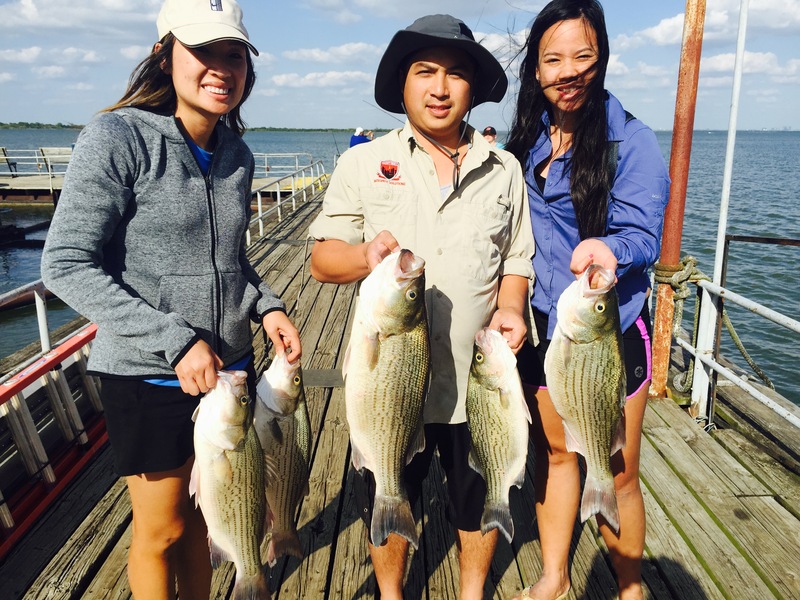 Lake Lewisville is stocked with Hybrid Bass every year, and hybrids provide lots of great fishing action on Lake Lewisville. Guided Hybrid Bass trips are by far my most popular trip, and are great fun for armatures and experienced fishermen alike. Also called Wipers, Palmetto Bass or Rock Bass; Hybrid bass are a cross between a Striped Bass and a Sand Bass. Hybrids cannot reproduce on their own and require human intervention to reproduce. Hybrid Bass are produced by crossing the White Bass and Striped Bass. Hybrids are known for their intense bite and the fight they put up. Hybrids rip drag from fishing reals with short intense burst of energy, and pound for pound they put up a better fight than any fish in the lake. The Hybrid Bass has the best of both the Sand Bass and the Striped Bass; they are hardy and resilient to high temperatures and they grow to a much larger size than the Sand Bass. The state record for Hybrid Bass is 19.66 pounds, and was caught at lake Ray Hubbard. Because Hybrids and Sand Bass are close cousins they often run together, chances are if you are catching Sand Bass that the Hybrid Bass are close by. It takes a good Hybrid Bass Guide to locate trophy sized fish. I have produced many large fish and know their habits and patterns. I use artificial lures so rebaiting and fussing with shad or minnows during the bite is not necessary. Primarily I am a Hybrid Bass Guide, and am excellent at putting fish in the boat. A good Hybrid Bass Guide can be as difficult to locate as the fish themselves. Read More. Sand Bass are native to Lake Lewisville, they existed in the Trinity River before Lake Lewisville was ever built. Sand Bass aslo known as White Bass are scrappy little fighters that school in large numbers. Sometimes when fishing for Sand Bass, you can hook a Sandie so large you are fooled into thinking you have a Hybrid Bass on the line. Lake Lewisville has long been known as a great Sand Bass Lake. Sand bass are great fishing for kids, they provide just enough fight for kids to have a good time fishing. Lake Lewisville Sand Bass are also great eating. Most fishing guides remove the blood lines from Sand Bass. The blood lines are an easily identifiable strip of red meat that runs the length of the filet. You can carefully pinch this meat out with your thumb and index finger. I never freeze sand bass with the blood lines in them as it makes the meat taste a little more gamie. Its easy to limit out on Sand Bass when you go on a guided trip with me. I am very good at locating the sand bass, and putting them in the live well. 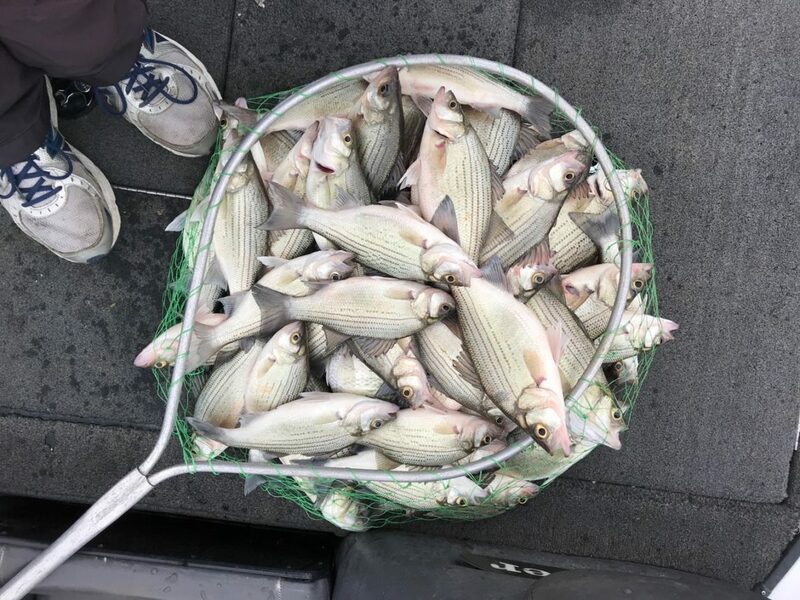 *For Striped and Hybrid Striped Bass, minimum length limit = 18 and a daily bag limit = 5 fish per person. *For White Bass, minimum length = 10 inches and daily bag is 25 fish per person. Sometimes small Hybrid Bass can be confused for Sand Bass, it is important to know how to tell the difference between these two fish. The vertical lines that run the length of the Sand Bass are unbroken while the Hybrid Bass has a pattern of broken stripes. If you need help Identifying a Bass click the link below for the Texas Bass Identification Chart. I use artificial lures for Hybrids and Sand Bass. You can take the fish off the hook, throw it in the live well and you are right back in the action. If you want an action packed fishing trip and want to take home a mess of hybrids and Sand Bass give me a call, and I will put you on the action.